As an outreach to our community, several women in our church have developed friendships with the Indian ladies in our neighborhood. On a monthly basis the group has gathered to enjoy activities such as jewelry making, crafts, cooking soups and pastries, baking pies and breads, and sharing lunch together. The attendance at these events has grown steadily from four women at our first brunch in the Spring of 2016 to 13 women this spring. Some of the women are also attending a weekly exercise class at our church. At every event we enjoy learning about each others families, cultures, and holidays. 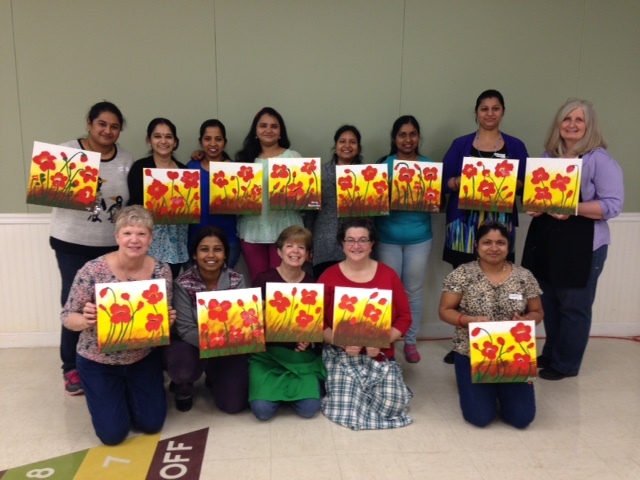 At an event in early March, we explored our talents at painting on canvas! These gatherings have been a great opportunity for learning from each other and building relationships.